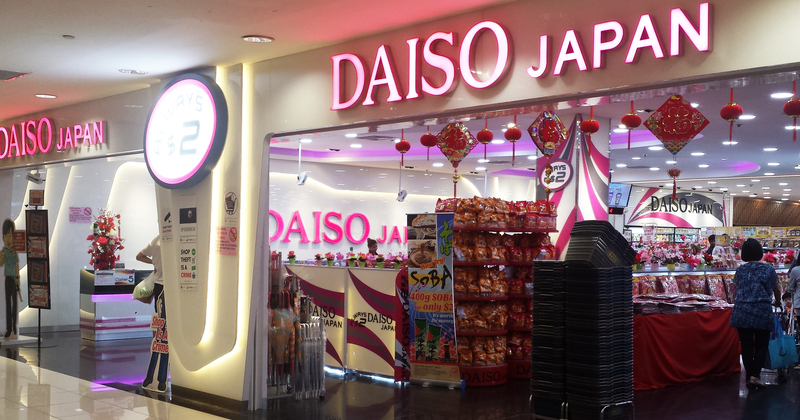 Daiso, a name we all recognise and love…but don’t know anything else about. 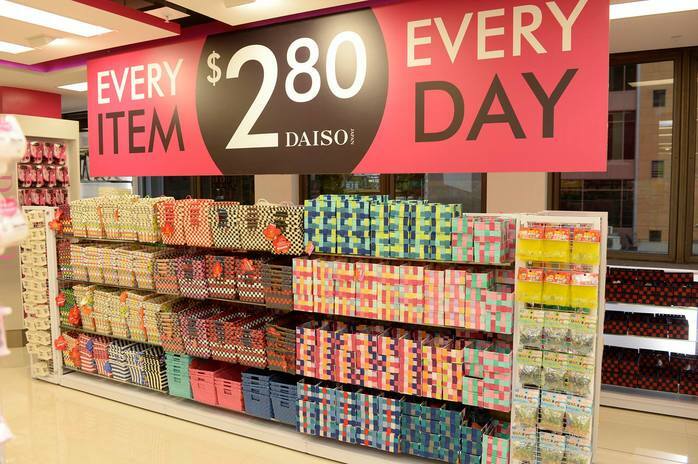 A favourite among aunties and aunties-at-heart, Daiso can be found in many heartland malls, a treasure trove for all things $2. Strolling through every outlet, regardless of in the East or West, Daiso always provides a consistent shopping experience. Shelves upon shelves stacked neatly to the brim, featuring all things plastic, a snack section that will satisfy any craving, and a compilation of upbeat Japanese ditties seep into every corner of the store. But behind all those bright lights and even brighter-coloured items, the company itself remains shrouded in mystery. So we did a little digging. First established by founder Hirotake Yano in 1972 in Japan, the store was called Yano Shoten and dealt in household items. It was only 5 years later, in 1977, that it became a corporate company and was re-named Daiso Industries Inc. In 1987, they decided to develop a chain of 100 yen stores – also the concept that shot them to worldwide recognition and success when it launched in April 1991. In its home country, Daiso sells items at a 100 yen (S$1.26) and up but if you’ve noticed, other international outlets don’t adhere to that price point. Singapore, as we already know, charges S$2 for each and every item. Our neighbours in the North fork out RM5.90 (S$1.86) for regular items – no thanks to a 60 sen increase early this year. In US, the base cost is USD$1.50 (S$2.09) and up while in Korea, it’s KRW1,000 (S$1.25) and up. Further Down Under, each item sets you back AU$2.80 (S$2.97). And there’s even an interesting story behind the non-round number too. Ideally we would have liked it to be $2.50 but the franchisees couldn’t make the financials work at that price, and the number eight is very lucky in Asian cultures so they decided to go for $2.80, and it stuck. Anything you pick up in a Singapore Daiso costs S$2, but pricing at overseas outlets aren’t as straightforward. From 2004, Japanese Daiso stores started selling products in tiers of 100, 200, 300, 400, or 500 yen, and this is the case in other countries as well. 97% of the products in Australia are set at the base price of AU$2.80, while the others cost more. Outlets in the Philippines charge PHP88 (S$2.45) and up. Perhaps we’re lucky that in Singapore, irresponsibly flinging every item we fancy into our baskets would still bring us more predictable amounts at the cashier. 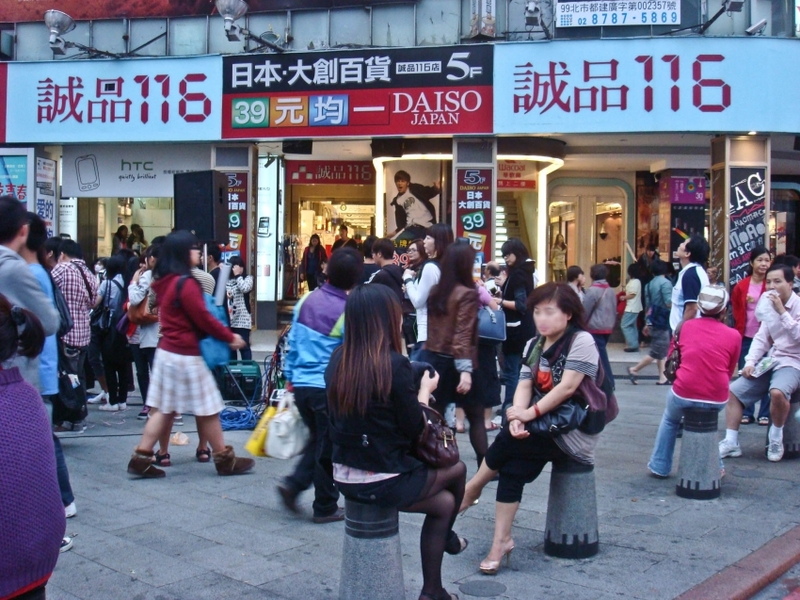 As of October 2016, Daiso has over 700 outlets and counting outside of Japan (excluding South Korea’s outlets – we’ll explain why later), and their rapid expansion was one that began August 2011. Starting with Taiwan, their next destination was South Korea in the same year, and then Singapore in March 2003 (the massive IMM outlet was the first). After that came a year-on-year expansions into the rest of Asia, the Americas, Middle East, Oceania, and Africa (only Mauritius has a Daiso at the moment). 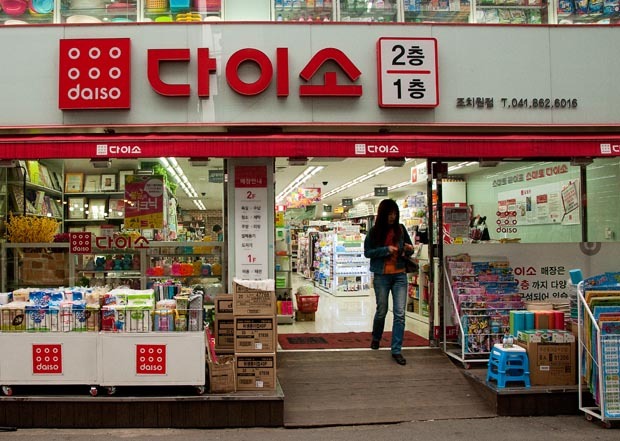 In spite of sharing the name, Daiso in South Korea actually operates as a separate entity. Founded in 1997 under the name ASCO Even Plaza by CEO Park Jung-Boo, it was the pioneering company in its country to take on the uniform pricing concept, very much like how Daiso did. Instead of going up against the South Korean chain, Daiso actually “thought highly of ASCO’s products”. And so, they signed an exclusive deal with Park in 2001. This led to Park receiving a KRW4.3 million (S$5,397) investment from Daiso to change their names from ASCO Even Plaza to Daiso. However, the similar name has brought about some confusion, with Park lamenting that “a lot of people still think we are a Japanese retailer […] And they don’t know that our sales are over a trillion won”. With over 1,080 Korean outlets and sales that hit KRW1.2 trillion in 2015, the chain emphasises the importance of quality in spite of the lower prices. They skip hiring middlemen and deal directly with Korean and international suppliers, which enables them to pass savings on to customers. 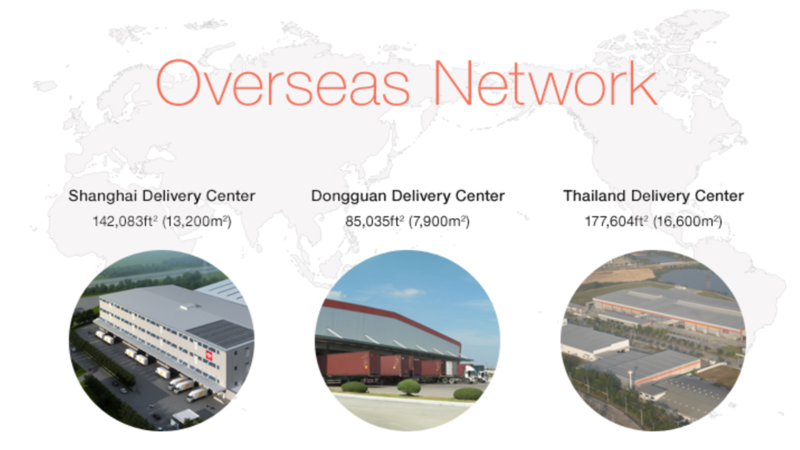 To keep up with the massive number of stores internationally, Daiso’s official website states that they have 3 massive delivery centres for their overseas network, and 7 domestically. For goods’ production, 40% of them are imported and mostly from Chinese manufacturers. However, over 90% of their products are unique Daiso brand products they design themselves. In 2007, they also set up a massive 890,000 sq ft plastic factory in Amata City, Thailand, which helps produce a bulk of their plastic products. By purchasing in high volumes and liaising directly with manufacturers, they save extensively on costs and like their Korean franchise, are able to pass on savings to buyers. As the only 100 yen chain in Japan to have expanded so successfully abroad, analysts speculate that it also dominates a JPY600-800 billion (US$5.8 billion-7.7 billion) market in Japan itself. One can only guess how much more they are making from their international markets. 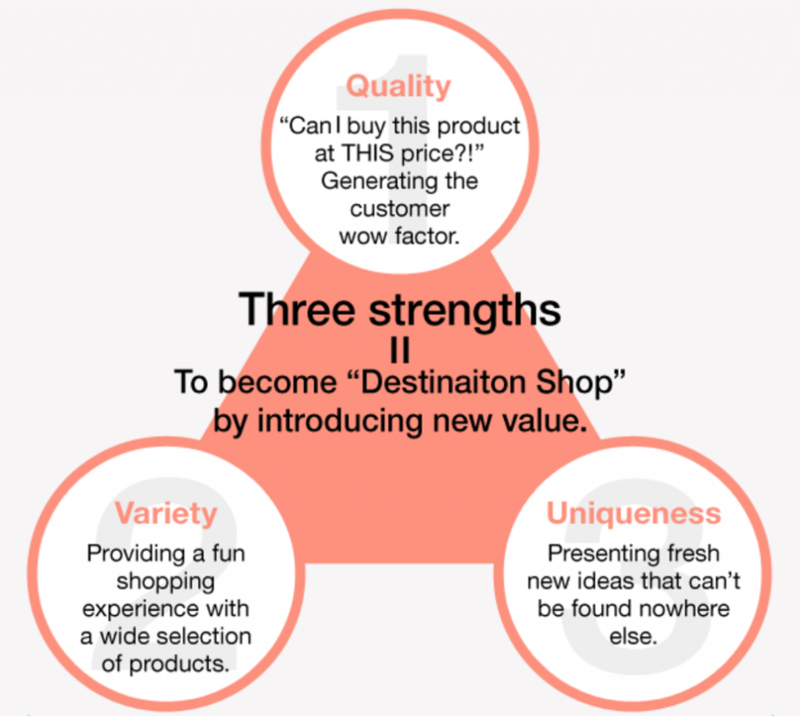 Listing the values of “quality”, “variety” and “uniqueness” as their pillars of success, it’s clear to see that they are definitely delivering on these aspects. In fact, as compared to whipping dead horses, it has also been revealed that the company “eliminates 600 items that sell badly every month, and replaces them with new ones”. This is a bold move, given that the design team would thus need to continually innovate new and exciting products. Perhaps it’s also due to the unconventional ways of Hirotake Yano, the CEO and founder spearheading the chain. Shifting away from the structured approach many Japanese companies typically take, Yano bases his decisions on “his gut feeling”. I don’t have any clear vision or strategy. I just like to try things out. And it is perhaps also this move towards flexibility and innovation that keeps the brand relevant all these years, and for more years to come.